Zander Srodes, at age eleven, created Turtle Talks – an interactive sea turtle seminar for children. In 2004, he wrote a sea turtle activity book to promote conservation in coastal communities around the world. The book is available in six languages. He has authored two other children’s activity books, one on the Gopher tortoise and one on freshwater turtles. There are over 250,000 books in print and all have been given away free. Zander travels the world promoting conservation. In 2010, he spoke at the International Youth Biodiversity Conference in Aichi, Japan and the 30th International Sea Turtle Symposium in Goa, India. He is currently lending support to efforts involving eco-tourism. Zander personally hosts groups of college students on two-week volunteer service trips to Costa Rica. There they work alongside local organizations and communities preserving Leatherback turtle nesting sites. 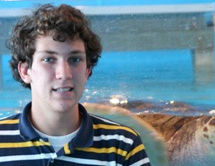 He is an intern for SEE Turtles, and the Sea Turtle Conservancy, and a previous intern at Mote Marine Laboratory. He participates in TEDx Teen talks. On Saturday mornings, he is a broadcaster on ESPN radio and talks about Florida sports.